The Golden Sounds of the Platters at Tribute Theatre is one of the favorite live music shows in Branson that will bring the old days through the music of The Platters. 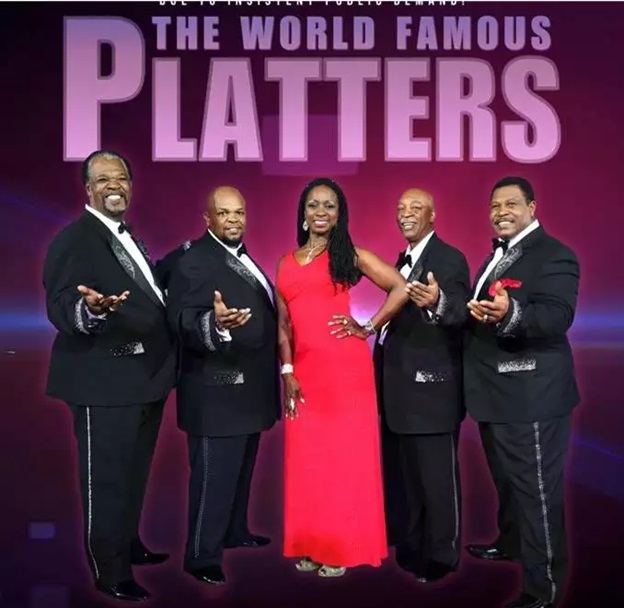 The World Famous Platters is composed of multi-talented and exceptional artists that include Dee Dee Hamilton, the soulful sensation Eddie Stoval, Willie Nash, and Lawrence “The Rooster” Randall. These gifted artists will entertain audiences greatest songs of the Platters including Smoke Gets In Your Eyes, The Great Pretender, My Prayer, Only You, Magic Touch, Harbor Lights, and many more. When the Platters was formed in 1953 and after producing immeasurable timeless classic songs, they became famous the world over and later become one-of-a-kind sensation. In 1955, the group entered into a recording contract with Federal Records which later became Mercury Records. Their first hit “Only You” topped the charts. Throughout the years, they were able to produce several hits and their list of timeless classics continued to grow to nearly 40 number one hits. This multi-talented singing group received 16 gold records. Due to their abilities to capture the attention of audiences around the world, they become a favorite music icon. This World Famous Platters Tribute Show in Branson will fill you with musical memories from the fabulous 50’s and swingin’ early 60’s. This live music show in Branson is sure to make you enjoy unforgettable classics made famous by The Platters. From start to finish, this fascinating show will bring you back to the days when you dressed the best on your Sunday date, drove a hot rod car to the drive-in movie, and danced the night away. While enjoying great harmonies of music from the time, you’ll hear Doo Wop songs that’ll get your feet movin’, and melodious songs that’ll have you snappin’ your fingers and singin’ along. Golden Sounds of The Platters won’t just make you remember the good ole’ days, it’s a perfect music show to share with the kids, grandkids, and everyone who loves classic musical hits. This widely known musical group in Branson has been awarded “Vocal Group of the Year’’ in 1999. Their tribute performance was considered “a must-see show” in the live entertainment capital of the world on several occasions. The World Famous Platters continue to provide entertainment of classical music to countless audiences in Branson. The bright neon lights in the entertainment district don’t just entertain Branson visitors but also talented artists and interesting attractions that abound in the area. The two-hour Platters tribute show also includes the hits of famous Motown recording artists like The Four Tops, The Temptations, and many others. Their melodious songs kept the world upbeat with soulful music and amazing vocals. This famous Platters show in Branson will wow you with their blues style and rhythm in the rock and roll era of the late 1950s. The World Famous Platters brings a fascinating live music show in Branson that will let you remember the old days through the music of The Platters.